You've most probably heard about the great uproar because one famous paladin blogger was found to be not what she (?) called herself. No. I don't want to wrote about the "scandal", because I couldn't care less. I want to write about the uproar itself. Several bloggers found it important to voice their opinion, including Matticus, the No1 healer blogger. His article had all the feelings that social people having now. If you ever want to become rich, you have to avoid all these traps. Even the title is wrong: "disappointment for paladins". Why? Somehow her guides are less valid than yesterday? Somehow her fun stories are less fun than they were? Why should anyone care if the person(s) behind the blog were lying in other things, like her identity. Matticus wrote "I’m actually quite impressed that someone’s been able to carry on this charade for a long time. We’re talking on the scale of years." Really, how could she pull this for years? Simple: because no one really cared. We came to the site for information or fun reads. The rest is not our business. In five years there must have been mistakes. No one bothered to catch them. If no one cared, why is the uproar? Matticus answers that too: "Too many people these days read something and just automatically assume it’s true since the source seems authoritative." Morons, I'd call them. Other people are sources of information, but you have to evaluate the information itself. It can be false not only because the source is lying, but also because he's wrong. If you believe anything just because someone told you, you're an easy target and you'll be separated from your money. One more thing, very typical for social people: "The thing about the blogging community here is...", well, I don't want to rain on your parade (I'm lying now), but there is no blogging community. There are individual bloggers who all write blogs, but this does not form them into a community, just like there is no "blue eyed people community". Social people imagine groups everywhere and they get attached to the ones they find likeable. That's a trap that marketing campaigns use when they build up a "community" image to a brand. You don't only drink some water with CO2 bubbles and artificial flavor, but you are in a group, typically a happy, party-group. You don't know the bloggers you read every day. You don't know me either. Everything you think you know comes from my writings. You don't know the guy who live next door to you. Serial killers lived next door to someone and they did not notice him. Scary? Not. You don't have to know me to read my blog. My statements are true or false because of themselves. My stories are funny or boring because of themselves. Still, the social people have bad feeling if they don't know someone. These mental schemes are remnants of the ages when we depended on certain people so we had to know them. "Ape subroutines" I call them. Once with coworkers and I was taken to a "coaching". (Or not. Maybe I'm just making this up. Does it matter?) The program was aiming for "social competences". "How to handle emotions? ", "How to mourn a loss? ", "How to accept a new person?" and so on. Hated it. On the last day they had a "trust-test". 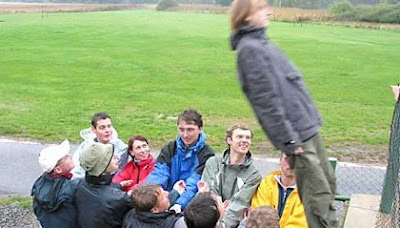 People were asked to stand on a large box and fall down to the concrete backside, just like on the picture (those are not us, that's just a picture I found on the net). Of course such action is lethal, unless the others catch you. So you must trust them. The coach asked for a volunteer. From the "nice, friendly, open and socially competent" people, no one stepped up. He gave another terribly annoying speech about the values of trust and asked again. No one volunteered. I did. Obviously they did not drop me. The coach was honestly surprised. He told "I thought you were closed and detached from others. How could you trust them so much?". I told him that when no one volunteered he gave such a speech that I'd rather smash my head on the concrete than listening to one more. Everyone were laughing and he turned red. I was lying. Of course I did not prefer death to a boring nonsense speech (especially since we got full salary for the coaching time). I deeply, truly, honestly trusted my coworkers. I trusted that they are not so stupid to go to jail for manslaughter. TL;DR: Don't trust in people. Trust in facts, systems, maybe even ideas. And just because you meet someone often (or read him often) don't think you know him! You don't. When something comes up that does not fit into your picture, it's not his fault to disappoint you. It's your fault to have expectations from him. He owes you nothing except what law says (and even laws can be broken). Remember the Forsaken motto: Trust no one! I actually believe there is a WoW blogging community. Not all WoW bloggers belong to it. There may even be other WoW blogging communities that I haven't heard of or belong to. But there surely is one: the network that has evolved around BlogAzeroth and Twisted Nether. I don't know how much you take part in it, but there's quite a lot of interaction and helping each other going on there. Some of them see each other in RL as well, like on the upcoming Blizzcon. I can't call it anything else but a community. Then to the question: can you judge someone from their writing, can you trust a person just from what they have showed in a blog? Maybe you'd be wise not to, but I chose to do it anyway, trusting my intuition. I gave out my login and password to Ixobelle so he could help me to fix some html coding that I was incapable of. He could have deleted my blog right away. He didn't. In this case I guess I subconsciously did an evaluation: is the benefit I get from attaining his help bigger than the risk I take that he's a fraud? And then I made a decision, which turned out to be right. If you walk around in life just playing it safe, trusting no one, you risk to miss out a lot of opportunities. Maybe worth considering for a goblin? I didn't really get the point of this either. People craft persona's for themselves all the time, especially online. I'm more concerned for the guides that were pulled by her from a ret pally resource website. Unless she lied about the numbers as well, I see no reason to not use those (Though I'm sure they'll be obsolete by years end XD ). Remember WoW? How many of those Night elf girls are ACTUALLY girls? OT: Did you go back into Uldaur yet? You'll notice that Matticus is actually making this story big (because you're right, someone lying about themselves on the internet is not really a story), because he has a lot of readers who see him as an authority. People who buy into it and agree that this person's identity (who wrote a blog they may have never read btw) matters become his community. @Larisa: If Ixobelle would delete your blog, you would only lose the time needed to restore it from the backup. YOU HAVE A BACKUP, don't you? @Gevlon: hm... honestly... I know I can take a back-up for the settings/layout thing. But can you actually take a backup of the texts that are published on the blog, if you're not self-hosted? @Larísa: Just copy and paste the texts into a Word Document and save the images into a folder. In the light of this "scandal", I think it's time that you came clean and admitted that your well-researched posts on WOW gold-making and your philosophy posts are in fact made by different people. 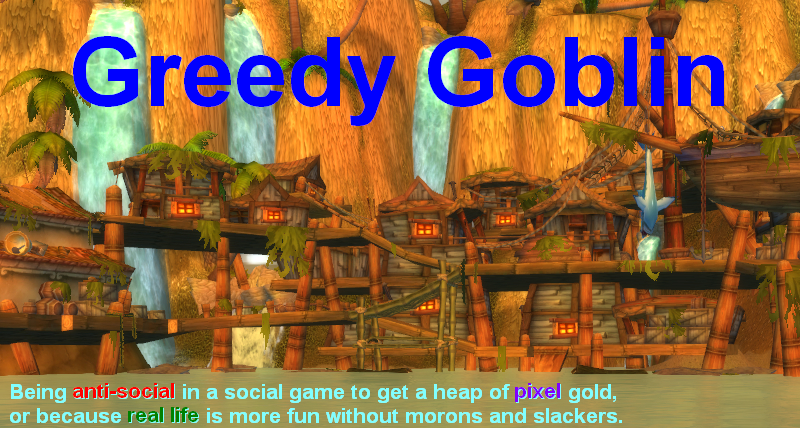 Not only is Greedy Goblin not a goblin... He's a /gnome/! All his advice on gold making, based on the premise of being a goblin, are based on a lie and thus worthless. So stop making gold off him! @Jamie: Careful, or he might call you a stalker and report you for harassment, resulting in all your posts getting deleted! On a more serious note (lets be honest, on a less stupid note), I had not heard of said paladin blogger until I happened upon a WoWinsider article some weeks ago. In your post "About trust" you state that her posts and ideas, tips and thoughts are no less valid, when the person behind them was lying. This vexes me, in more ways than one. I'm reading more and more about a fraudulent persona, a mystifying individual, whom took part in some aspects of identity theft (borrowing, if you will.) I wouldn't disregard her writings, as even the craziest of crazies can put something worth reading on the internet, but will I look at all of her blogs in the same light as the blissfully ignorant person I was those few weeks ago? Probably not. You see, when someone betrays trust, or is accused of such, it (sometimes unnecessarily, but most definitely) puts all that they do in a bad light. Another example, one upon which I must tread lightly, is your own particular blog. You poke fun at the issue throughout "About trust" with the (anti-) parenthesis, and miscellaneous little quips thrown in the mix. But you're so steadfast and opinionated that I think sometimes, you'd have an incredibly tough time playing devil's advocate. The problem is, it is very hard for one to argue or have dialogue with another whom is faceless. Once that person manages to provide an identity, even diatribes are given more weight, more oompfh, if you will. The paladin-blogger-whom-shall-remain-nameless-lest-my-post-get-mysteriously-deleted utilized anothers identity for whatever reason. The personality and familiarity with which her articles and tips are written are associated with said identity. Said identity is now discovered to be fraudulent (due to it not belonging to the originating author), and your incredulous that people don't trust her writings anymore? "Bigotry is a disease that must be cleansed, in order for humanity to maintain forward progress." Also, apologies, the made-up quote ended up reading aloud much harsher than I'd imagined it in my head. I think Larisa is broadly sensible, as usual. One more thing, very typical for social people: "The thing about the blogging community here is...", well, I don't want to rain on your parade (I'm lying now), but there is no blogging community. There are individual bloggers who all write blogs, but this does not form them into a community, just like there is no "blue eyed people community".That's like saying that because the Canadian people are not joined into one amalgamated mass, there is no such thing as Canada. Societies exist only in the minds of people--but that gives them heft and influence. The reason people are so worked up about Ferarro is not because she stole some pictures. It's because she pretty much adopted Sarah Townsend's whole personality. Images, location, posts, interviews, motto--all stolen by Ferarro, who probably has some serious issues. It affects her credibility. If someone would lie about something that large, why not lie about other things? The moral is: Your co-workers weren't your friends, yet you managed to unite and work for a common goal: Letting you fall without getting injured. Sosial people believe that they have to befriend their co-workers in order to work together, but this experiment proves them wrong. However, something made the experiment succesful. You weren't befriended with your co-workers, so friendship was not the key to success. It was trust. Trust does not have to be related to friendship. Trust can simply be business: "Let's make a deal. I will do an action (falling), and you will eliminate the cons of the action (injury)." Trust in this case is when two or more parts make a deal, and believe that the partners will do their part, as agreed upon. Trust isn't neccesarily related to friendship (socializing), but can clearly be useful (in the case that someone sees a benefit in falling towards a concrete floor, for example). Trust is what makes the world go around, not friendship. Trust is what makes the AH work: You post an item, trusting the system when it agrees to give you money from buyers. You trust your employer to give you salary for your service. The moral? Success can be the result of trust, and trust can be gained without friendship. Even a goblin should be able to see that stealing content from another blog is a bad way to go about blogging. Why was this necessary? Impersonating someone is actually illegal, and Ferraro could be sued for it in the U.S. I cannot approve her technique at all--it's self defeating. Her blog is now pretty much dead, because she's lost her credibility. Like it or no, each blogger does have to build credibility with his or her own leadership. You don't need photos or a RL identity (fake or real) to do so, but something like this undermines the trust you've built with your readership. Similar things have happened to writers who publish fake memoirs or autobiographies--their careers are over, and they get sued if they stole their material. I still fail to see any consequences for a wow blog. I've never visited the blog in question, and while some personal stories and anecdotes are nice to read scattered between the wow stuff - I read my wow blogs for wow stuff. I couldn't care less if some poster was made up of 20 people and argued they were only one, it just doesn't matter. Matticus, for the most part, only has a vague or general idea of what he's writing and saying. His healing advice is usually bad and his generic "tips" are faulty in some way. First off saying that there is no WOW blogging community while you yourself are commenting on what another blogger posted is just silly. If there was no community you would not be reading and commenting on what others have said, as you do often. Second, saying not to trust people is just as bad from a business perspective. Trust is a very large part of doing real business. For example I make things from steel. When I place an order with another company to deliver that steel I am trusting them to follow through with that order. Sure I can look at past history and see that they deliver on time, but I have no real guarantee that they will deliver. Or a classic example is when you need something. You and the other business owner have a lunch meeting. You need the item by Thursday. The other businessman says, “I’ll get it there by Thursday. I promise”. You must trust that he will do as he says. This is a common thing in business. It happens every day. Trust is also an integral part of all contracts. We use a contract to formalize an agreement. But that agreement is always based on the assumption that both parties will do what they have said. A loan is the greatest example of this. The lender is trusting that you will pay back what you borrow. This is why a lot of banks are called “X Bank and trust”. It is not an accident. In short if you do not trust people you will be severely hampered in your ability to do business. You will always tack on so much crap to protect yourself due to the lack of trust; no one will work with you. Gevlon, and the Forsaken put it nicely..."Trust no One"
Also those chicks that promise you naked pics in your email...LIES!!! Isn't " Trust no one " an X files slogan first? I'd agree to a degree, but there really are communities for everything. There are communities, to this day, that are blue-eyed(Nazi's were a big supporter of a Blond-hair, blue-eyed race) To point out I didn't use the word "community" is just semantics. When I read blogs, it's usually to read something I enjoy(entertainment) not so much to learn something(in an academic sense), but reading someones blogs are fun for me in part because it stirs the soup in my head I call a brain, but as for "believing" no I definitely do not outright believe most blogs. If something catches my attention that I plan on relaying to someone or commenting about in my own blog, I'll hit the old research road beforehand. Good advice. We like to believe that there is a universal right and wrong. However this is a lie and everybody has different ideas of what is right and wrong. Many people have surprisingly liberal ideas of when it may be right to betray a person's trust. Their ideas of when it is right to do so, are most likely different than yours, even when that person is someone close to you. Don't turn your back on them. Oh noes, people lie in the Internet!!!!!! That said, the same principle applies to the whine that people do when they are told that they do less DPS than the tank. People are happy being morons, but they dont like feel like morons. http://bloggerindraft.blogspot.com/2008/06/new-feature-import-and-export.htmlIf you choose to self host, say, in Wordpress, there's an option to import from a blogger blog built in. While I got some good info on optimising rotations for my ret pally off Palidon Schmadin, the big issue I have with what happened is the outright plagiarism of text and video the author engaged in, and the use of another person's pictures without their permission. I couldn't care less if someone passing themselves off as a hot girl turns out to be a guy, in fact I laughed quite hard when I read the story for the 1st time. But plagiarism is not cool in any way, shape or form. "The paladin-blogger-whom-shall-remain-nameless-lest-my-post-get-mysteriously-deleted utilized anothers identity for whatever reason." How do you KNOW it was stolen? Do you know both ferraro and the techdarling chick? How do you KNOW techdarling is not just playing along? You are all acting with outrage and shock over something that you still honestly know little to nothing about. This may be a very nice online drama written just for it's audience. I find it interesting that there are very few posts on techdarling anyway. And there are no posts for Nov-Dec (WOTLK release) or April (3.1 release). And how could "ferraro" gain access to this chicks video before it was posted anywhere? Think people, don't just react. I have to admit I never heard of the paladin blog before, but I don't understand the uproar either. If it was an elected official that turned out to be just a figurehead while someone else wielded the real power (i.e. George W. Bush), then I could understand why people would be upset. But being upset about a WoW character who isn't who they say they are? I have news for you: WE ARE ALL LYING! My character's name is Zaphind, and I pretend to be a Draenei Death Knight. But I must confess: that's not my real name, and I'm actually a human. I know, scandalous. Gevlon's point is correct: the information in the blog about playing a Paladin was either valid or invalid on its face, and had nothing to do with the name(s) of the people writing it. The information is just as valid today as it was before the "scandal" broke. It hasn't gotten any more or less correct based on this new information about the bloggers' identities. The assumption is that people tell the truth by default and only lie when they have a reason. The assumption can be made since most people fine it easier to keep track of the truth. If a person lies for either an unknown or uncomprehended reason, the reader has less basis to decide whether to trust other information the person presents. Thus you have to judge the truth of all of their statements on your own which pretty much means you wasted your time as far as information gathering goes. It this particular case,we found that we didn't know why the person lied, but given that the lies seem to be merely the personal data while much of the in game data seemed backed up by players trying out the information (our basis for judging the truth of statements made). At the same time, people visit the blog for social reasons would find that since their basis for visiting was incorrect - whether they should have spent their time visiting is brought into question. Gevlon. You mean you are not REALLY a goblin??? I feel so betrayed :) ROFL Keep up the good work, my man, you are quite amusing.